Adventure isn’t always what you think it’s going to be. For me, it always has to do with family, hiking, writing or art. Recently I’ve put a lot of work into an Etsy (silkandstoneboutique) shop and getting earrings done for my daughter to have a LuLaRoe party. That work is in conjunction with finally getting my book written and teaching yoga and senior strength training. All of those I love. So, all in all, life is good. This is my lovely granddaughter modeling earrings made for the party. The earrings were made from quilt scraps given to me by a friend. I try to make everything from re-purposed items. All of my jewelry creations are either fabric based or created from things found while hiking. We have some really great rocks, discarded metal, and wood in this area and I find pieces that I eventually turn into something. My method is to put pieces I love on my work space and let ideas simmer. Another great source of inspiration is Pinterest. I also see metal jewelry on TV and wonder how I can make it out of fabric. I would need two more lifetimes to create everything I envision. I’ll certainly never live long enough. This is a piece made from leather given to be because a furniture store went out of business. I have all of their furniture samples–a good example of why I need two more lifetimes. I want to make hand bags too! Something is always cooking in my brain. It turns out that the greatest adventure is life itself and what we make of it. We are all creative and just need to find out what makes us sing inside. That is adventure. I haven’t really had an adventure in a great long time. At least not the kind you’re used to seeing here. My latest adventure is learning to teach chair yoga. Sounds easy? Not so much. It turned out to be a lot harder than I’d ever imagined. I teach seniors. I’m a senior. We all have limitations. But I am trying some new things in my art world. Here’s a picture of a piece of silk I’m embroidering with floss and beads. It is stuffed in the trapunto method. Later it will be combined with leather to make a bag. I am also making a different style of earrings. These are fabric with semi-precious gem stones added. I have them on display at Gilger Designs in Ames, Iowa. He has this great fine design shop and I am honored to have them there. And they are such fun to make. I made a pair for my niece and my nephew’s girlfriend. I made me some too. Of course, these are in progress here, but they turned out beautifully. Now, a friend of mine is setting up an Etsy shop for me–another great adventure in the art world. Everything takes time and energy. But creativity is the domain of us all. We are by nature creative and for me it has become a real need. I suspect it is that way with all artists. For this new year I hope you all have lots of time and opportunity to create the things you love and that this brings you great joy and peace. Finally. An adventure to talk about. It’s been so bloody hot here and we’ve been so busy we haven’t really gone out into the desert, but I freaked and asked my hubby if we could please have a day together. I really wanted about a week, but that wasn’t even an option. 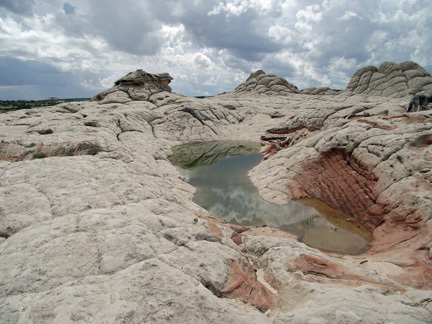 So, we loaded up the dogs and a picnic and headed for White Pocket–a round trip of about 350 miles. This old body has a hard time riding that much, but it was worth it. We arrived at camp and set up the table and chairs and broke out the food. I cheated and bought a rotisserie chicken from the grocery store to save on my efforts. 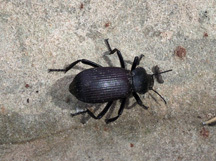 We had ants and this little guy as visitors while we ate. My sister loves little things, so I took the picture for her. After lunch, we headed out for the white rocks. Unfortunately, my shoes hurt my toes, so when we reached the sandstone, off they came. The really cool thing about it was the tanajas that were filled with water. Neither I nor spell check know if that is spelled correctly, but they are indentations in the sandstone that fill with water. Some of them had tadpoles in them and others had had enough water that cattails were growing. 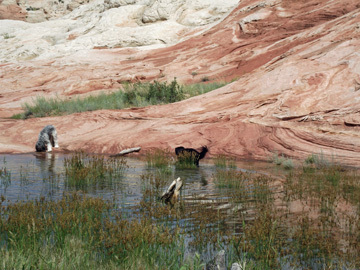 Molly, the black dog, took advantage of the cool water and began wading through all the tanajas she found. But our Max only got his feet wet. When my feet hurt, I just dipped them into the water. It was a really lovely adventure! 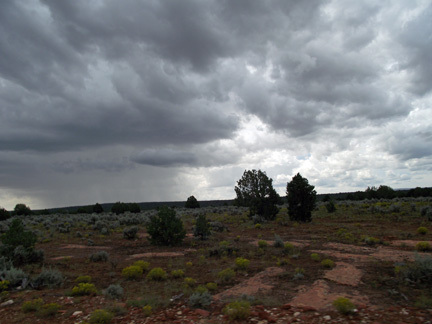 We also encountered rain, a welcome relief in the desert, which is ever changing. So, I’d say the adventure was a success. I loved it, hubby loved it and the dogs had a great time. The scenery is well worth the drive. So, I guess I’d do it all again. Maybe next time we can camp there and explore some more.